Posted on October 21, 2012, in Uncategorized and tagged american, angora, breed, californian, heritage, local, meat breed, meat supply, medium, new zealand white, production, raise, Satin, show. Bookmark the permalink. 22 Comments. We began raising our American Chinchillas last spring and just love them. We didn’t chose the breed, a local breeder had some and was willing to help us get started, but we couldn’t be happier. We recently bred our first doe (she’s due in about 1 week). Our breeder consistently gets litters of 8+, he butchers them at 12 weeks at which time they dress out about 3 pounds each. If anyone in the Western Washington area is looking to begin breeding, we’d love to help you get started with American Chinchillas. Love what you guys are doing!! I could not agree more. I think you hit the nail on the head in the first paragraph. I tell everyone that comes to me asking for help that the most important thing they need to decide is what their goals are. There is so much stuff out there about which breed is better, and how to breed etc. But in my opinion, when it really comes down to it, if you are breeding less than 10 rabbits, which most people are, then most of that stuff does not matter. For the average urban farm, if a rabbit consumes 2oz more feed or takes an extra week to get to fryer weight, it doesn’t really matter. Most people don’t raise rabbits to make money but rather because they enjoy it, they like knowing where their meat comes from, they like to show them, etc. Once you truly work out those goals, then the prospects of what type of rabbit is best for you really opens up. I agree raising homestead rabbits should not be problematic, relax and enjoy raising your rabbits! Good roundup. I’d really like to get some Silver Foxes, but can’t find any here in Australia. My friend is switching his cages from meat rabbits to mini-lops, helping his granddaughter get into breeding them. They’re hoping she can make some good pocket money – a nice mini-lop costs about $110 here! The good news (for me) is that he’s giving me his remaining breeding stock for free. He wants them to go to someone that will continue the lines, and not just stick them in pet hutches on the lawn and forget about them. One bit of helpful advice I got was to start out with whatever you can get locally for a good price, and don’t worry about particular breeds. If you find you don’t like raising rabbits you won’t have wasted lots of money. You’ll learn how to feed and manage them without potentially expensive mistakes, and you’ll have a better idea of what you’re looking for. You may even find that you’re happy with what you’ve got and don’t need to go for a more expensive breed. I greatly agree with the buy local for your breeders. Here in Florida, you need rabbits that can handle the heat and humidity. I was trying to raise Rex’s but had to switch to New Zealands because the the male Rex’s couldn’t handle the heat, and I only had about a 2 month window for good successful breeding. Though I do miss the soft fur, the higher production (currently have 12 new kits, 7 to be processsed, and a doe ready to pop any day now) of the New Zealands more than compensates for that. My next task is to learn how to tan my own hides for homemade gifts and such (I have a bunch of hides in the freezer right now). I raised Satins for several years, and they were fantastic meat rabbits. One breed that I disagree with your recommendation for a homestead breed is the Flemish Giant. Quite frankly, although they are great rabbits, they are inefficient as meat producers. The feed ratio and the bone/meat ratio is horrible; one would be better suited for breeds in the ARBA’s Commercial (or even Compact) class. I’m actually considering raising rabbits again, and would likely go with a pair of NZW or Californian does (or even one of each), plus a Florida White buck. Grin you left both Giant and Standard Chins out of your list of breeds. Actually for a couple or small family I feel you can hardly go wrong with Dutch for you meat breed. They are ready to slaughter at about the same age as a Pal and actually seemed to give us a higher dress out rate. I listed the most popular breeds that popped in to my head when writing this post. I knew I would miss some, I do agree with you on Giant and Standard Chins as good meat breeds, in the past I raised American Chins they were a great breed for the homestead! As for the Dutch that is the breed that got me started raising rabbits 30+ years ago! When I was growing up the Dutch was crossed with Flemish for a great meat cross. info. I’m satisfied that you shared this useful information with us. Please keep us up to date like this. Thank you for sharing. very helpful piece, and answered a lot of my questions. We raised some rabbits for our own use (meat and pets) a couple of times over the years, and just went with whatever breed was available at the time. Getting ready to start again in our new location, and wondered what would be best for meat and maybe fur in N.E. Missouri. See what meat breeds are raised in your area, they would have had generations living in your specific climate. I really enjoyed this piece. I knew that, in general, rabbits didn’t do well in hot weather and that it would cut down on their breeding season, but I hadn’t thought of it as a factor for choosing a particular breed. Are there particular breeds (Florida Whites are the only obvious example I can think of) that are more hardy in southern climates than others? I have really had my hart set on starting out my rabbitry with American Chinchillas, but perhaps I should reconsider. I live on the coast of Georgia. AmChins are really difficult to find in the Southeast US. I wonder if they might not flourish here? 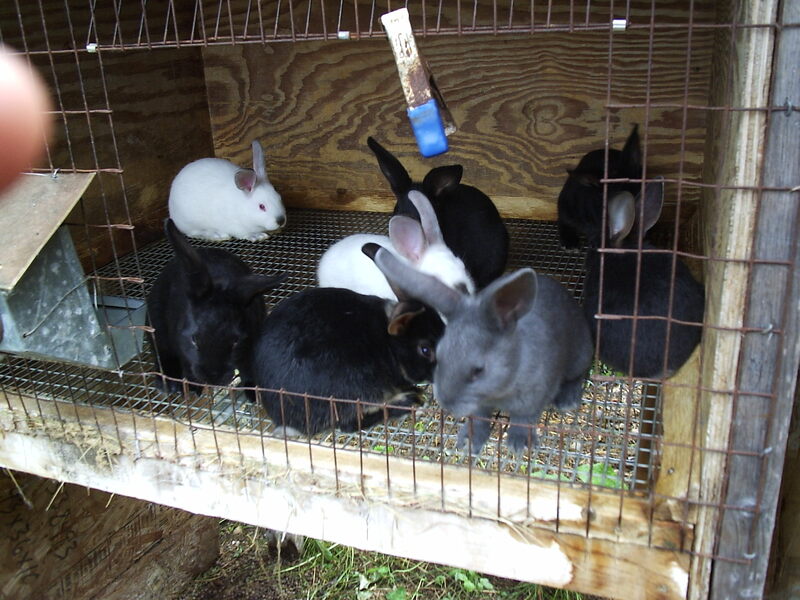 However, I do know someone nearby who raises french angoras and her rabbits seem to thrive (though they have to put frozen water bottles in the cages on a dozen or so of the hottest days of the summer. She hasn’t lost any to heat and they are very hairy. Any ideas of how I might find AmChins east of the Mississippi? I raise Florida Whites in SE Tx because they are a small meat rabbit. I am 58 and short so I wanted a small meat breed. It has worked out good for us. They have 7 to 9 kits per litter. they feed out cheaper using only 1/2 cup of pellets a day. I prefer to feed more greens than pellets so that saves even more on pellets. Have also raised Florida Whites and had great results, I just prefer larger rabbits. I don’t see Giant Chinchilla on your list. It’s an excellent breed for meat as it was bred to eat more hay and less pellets. Less cost to grow out. I’m pretty sure it’s the only rabbit that is still judged purely as a meat rabbit. They are currently #5 on the rare list and needs some attention so these great rabbits don’t drift into obscurity. The Giant Chin is a great rabbit for the homestead. What ones do you like to use best? *GOOD MOTHERS, EASY TO FOSTER, BECAUSE WE HANDLE OUR BEVEREN OFTEN, WE ARE ABLE TO HANDLE KITS (WITHOUT INTERFERENCE FROM DOE) FROM DAY ONE. *ARE A HERITAGE BREED, ON “WATCH” LIST OF LIVESTOCK CONSERVANCY”. BLUE, BLACK, AND BLUE-EYED WHITE.